RECON TWO is a larger version of RECON ONE. It has the same design concept as the RECON ONE with one primary exception; it has a padded sleeve that will hold up to a 13" notebook. The organizer side has three pockets. A padded pocket (5.7" (Deep) x 3.5" (Wide) x 1" (Thick) designed to hold a portable charger, a middle mesh zippered pocket with key ring and an additional pocket to hold either your phone or mouse. The notebook compartment has a Velcro detachable padding to help accommodate an 11" notebook if needed. To accommodate a larger 13", all one has to do is simply remove this padding. Shown with 1" all-round removable padding for 11" notebook partially removed. 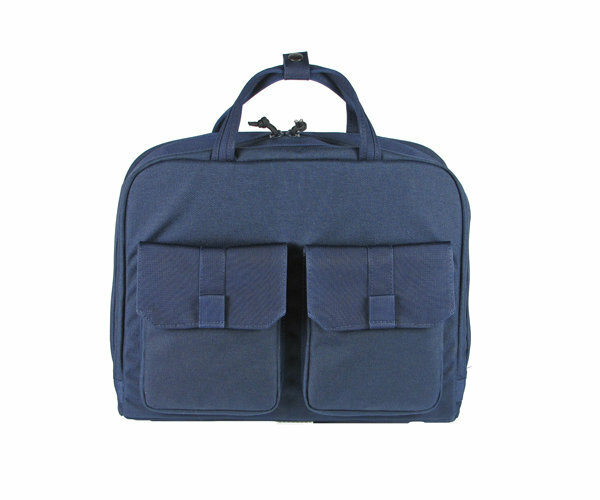 All this organization along with the flight caddy inside a bag that comes with two padded exterior pockets with nylon webbing flaps and magnetic closures. Behind the pockets, additional space is available to hold items like your flight tickets. Last but not least, the RECON TWO is designed to slide securely onto your luggage handle for ease of travel. Caddy fits all iPads tablets, Samsung tablets, Nexus tablets, Kindles, Nooks, etc. Fits up to 13" notebooks with padding removed.